Your customer service employees are your brand representatives, the human face and the voice of your company. Their competence, soft skills and communication habits count tremendously toward the quality of the service they provide to your customers and impact overall customer satisfaction. So what are the most common mistakes made by customer service professionals? 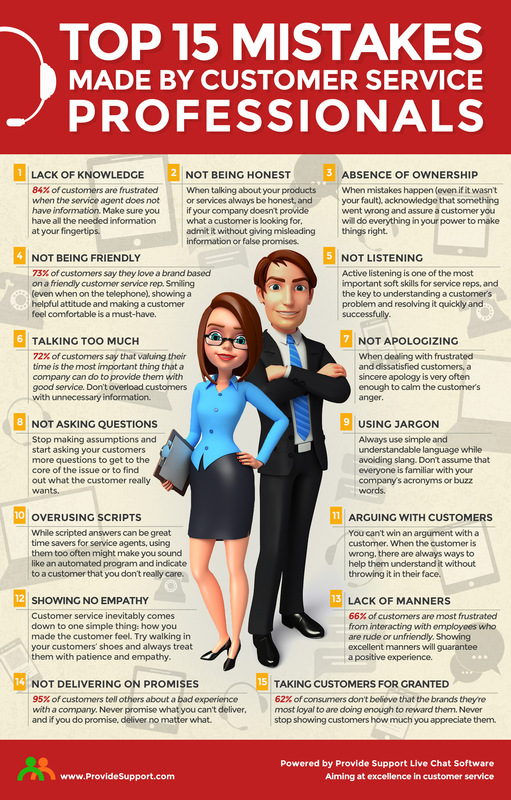 In this infographic we’ve collected 15 most dangerous mistakes that can have negative consequences in customer satisfaction and loyalty. Is your customer support team guilty of any of them? In fact, all of the listed mistakes are easily preventable. Make sure your customer service employees are aware of what exactly they are doing wrong when interacting with customers and provide them with regular training and mentoring to help them grow their professionalism and improve their skills. Is there anything else you would add to the list? Feel free to share your thoughts with our blog readers! This entry was posted in Articles, Infographics and tagged customer service, customer service mistakes, customer service training, soft skills. Bookmark the permalink. Love #2. I think so many times companies will try to paint themselves in a good light that they are willing to “stretch the truth” in order to make a sale. That just leads to unsatisfied customers, returns, and bad publicity (often in a social media disaster). If you are honest, you don’t face any of that and you generally leave the person with a more positive view of the company. We have received referrals because we were honest and did not try to force a sale. Thank you Andrew, agree, stretching the truth in order not to lose a customer and complete a sale is only a temporary solution that might have really bad consequences in the long run. I loved your infographic! It looks fun and realistic plus very professional. I wish I could be that creative. Thank you Leslie, glad you enjoyed it! 1) Not actually solving the customer’s problem. Quite often this means the agent addresses the symptoms, but not the cause, so the customer needs to call again quite soon. 2) Making it hard for customers to resolve their issues. According to ‘The Effortless Experience’, the majority of customers have already tried to resolve their problems in another way and indeed are often on the company website while talking to an agent. Agents need to understand that this is probably happening. Also, of course, handovers and callbacks where the customer has to repeat everything they said the first time are all too common.